The data collection of the Great Red Spot is part of Juno’s sixth science flyby over Jupiter’s mysterious cloud tops. Perijove (the point at which an orbit comes closest to Jupiter’s center) will be on Monday, July 10th, at 6:55pm PDT (9:55pm EDT). At the time of perijove, Juno will be about 2,200 miles (3,500 kilometers) above the planet’s cloud tops. Eleven minutes and 33 seconds later, Juno will have covered another 24,713 miles (39,771 kilometers) and will be directly above the coiling crimson cloud tops of Jupiter’s Great Red Spot. The spacecraft will pass about 5,600 miles (9,000 kilometers) above the Giant Red Spot clouds. All eight of the spacecraft’s instruments as well as its imager, JunoCam, will be on during the flyby. 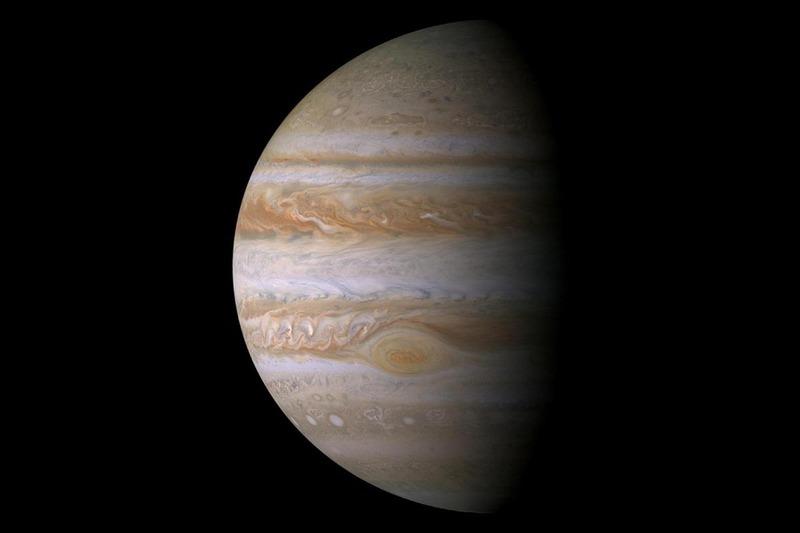 On July 4th at 7:30pm PDT (10:30pm EDT), Juno will have logged exactly one year in Jupiter orbit. At the time, the spacecraft will have chalked up about 71 million miles (114.5 million kilometers) in orbit around the giant planet. Juno launched on August 5th, 2011, from Cape Canaveral, Florida. During its mission of exploration, Juno soars low over the planet’s cloud tops — as close as about 2,100 miles (3,400 kilometers). During these flybys, Juno is probing beneath the obscuring cloud cover of Jupiter and studying its auroras to learn more about the planet’s origins, structure, atmosphere and magnetosphere. JPL manages the Juno mission for the principal investigator, Scott Bolton, of Southwest Research Institute. The Juno mission is part of the New Frontiers Program managed by NASA’s Marshall Space Flight Center in Huntsville, Alabama, for the Science Mission Directorate. Lockheed Martin Space Systems, Denver, built the spacecraft. JPL is a division of Caltech in Pasadena.